By Kathy Kristof. September 2, 2013, 7:38 AM.... your net sales price is $256,740. But because you have been paying down your loan a little bit each month, you only owe $181,968. You cash out with $74,712. Brilliant move? Well, let's compare your net profit to what your renter twin would have. He didn't get your tax deductions, which we'll estimate at $100 a month. But he didn't have to put $40,000 into the house down payment and he had more spendable income because he didn't have to pay property taxes, insurance, additional utilities and maintenance. Assuming he put that $40,000, plus $350 per month (that's the $450 per month more you spent minus the $100 monthly tax benefit) in a mutual fund earning an average of 7 percent over the same five years, he'd have $81,762 - about $7,000 more than you. But why does it always seem like home owners get rich faster? Probably because most renters don't save the money they're not spending on homeownership. A home is a form of forced savings plan that you must participate in as long as you want a roof over your head. Renters are not forced to save. They can go to bars instead. Am I saying home ownership is stupid? Not at all. If you want a home, it's a great way to spend your money. There are few places where you'll spend more time or appreciate more than your own kitchen, living room or garden. But don't kid yourself into thinking it's a fabulous "investment." However, "... a mutual fund earning an average of 7 percent..." is very, very far from a sure thing. Of course, neither is that housing-value appreciation; but Kathy did add that such rises are not guaranteed by any means. Something she didn't mention though is that rents tend to track inflation while mortgage payments on fixed loans remain the same. Inflation will put more pressure on the average renter. We'll be posting a link to an article on this aspect soo n. Stay tuned. Housing construction needed in California. By GEORGE CHAMBERLIN. Friday, August 30, 2013. "More homes clearly need to be built in the West to relieve price pressure, or the region could soon face pronounced affordability problems," said Lawrence Yun, chief economist with the National Association of Realtors. Yun is suggesting the affordability equation will be affected by higher prices as the demand for homes grows with a limited supply available. New home construction has an economic impact beyond the immediate neighborhood. The California Homebuilding Foundation in its report on the economic benefits of housing in California finds things have changed dramatically from the peak in construction. "In 2005, permit levels topped 202,000 units, generating an economic impact of over $67.7 billion and nearly 487,000 jobs. Housing construction declined each year from 2005 until bottoming out in 2009 at $13.8 billion of output and 76,000 jobs," cites the foundation report. For 2011, the most recent reporting period, the foundation says new housing construction contributed $20.7 billion and supported nearly 123,000 jobs, a move in the right direction to be sure, with only more room to grow as demand increases. This link ties in with the Buy v. Rent question and addresses the issue of rent inflation mentioned previously (2 links ago). By Marc Prosser. 8/31/2013 @ 11:27AM. 1) You are purchasing an asset that provides a yield. In fact, you are your own tenant. Building on the example above, the assets costs $400,000 and starts paying $3,000 per month in "interest". The initial yield is 9% ($36K / $400K). The example is providing a yield which is better than you will find in your personal case. In many places, the home price to rent ratio is around 18 or an initial yield of 5.5%. Essentially, this is very close to the yield on long-term, higher rated high yield bonds. 2) You are borrowing money at a very low interest rate, both in absolute terms and compared to treasuries. At 4.37% for a 30 year mortgage, you are borrowing money for only 0.66% more in interest than the US government can borrow with a 30 year bond. Without the home as collateral, your borrowing costs would be dramatically higher. Its unlikely that you would be able to borrow money for less than 10%. 02 Sep 2013. By Dan Green. 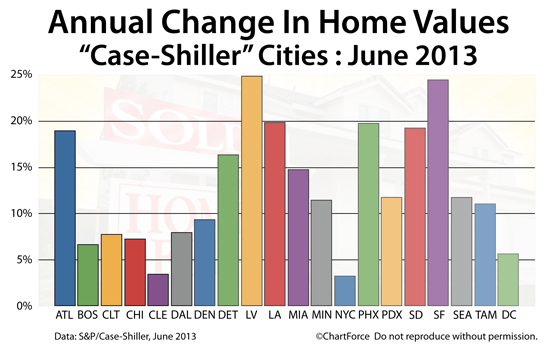 Standard & Poor's Case-Shiller Index reports that home values rose on a monthly, an annual basis, in June. In some cities, home values have climbed by a lot. Regardless of what city in which you're buying, though -- New York or otherwise -- remember to show restraint with Case-Shiller Index data. The report should not be used to make buy or sell decisions. The Case-Shiller Index is a flawed metric and may push you to improper conclusions. This entry was posted in Editorializing, General Real-Estate News, News-Alerts Digests. Bookmark the permalink.